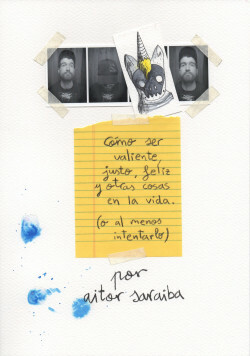 A little instruction manual for life by one of the most prominent young artists on the Spanish scene. In these inspiring pages filled with Aitor Saraiba’s distinctive iconography, he suggests a series of creative activities that will help to change the way you see the world. Who I am, the people I relate to, my most heartfelt wishes... art has always been a form of expression through which humanity has unleashed its emotions, one’s ‘true self’. Saraiba places his distinctive illustrated ‘tool box’ at our disposal to help us find ourselves and reveal the minor everyday poetry that lies beneath the trivialities of our everyday life.